Today is international Talk Like a Pirate Day! So if you don’t already swagger and curse, chug rum and sing songs of the salt salt sea, today is the day to start. And if just being a cool person isn’t enough to motivate you to talk like a pirate, Krispy Kreme donuts is giving away a free dozen to anyone who comes in (today only, September 19th) dressed like a pirate. 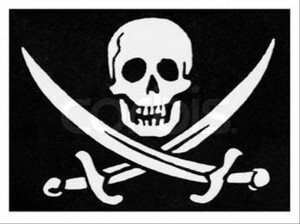 Pirates traditional gold earrings weren’t fashion statements: they wore them to be sure they could afford a proper burial. Pirates sustained themselves through months on the high seas by imbibing LOTS of alcohol. Booze was safer to drink than “fresh” water which often carried illness and grew slimy after months in wooded barrels. The favorite drink of pirates was rum, also known as grog, kill-devil, demon water, and Barbados water. Most of the treasure captured by pirates didn’t last long enough to get buried. It was spent on gambling, women, and alcohol. The St. Augustine Pirate and Treasure Museum Florida, is “the largest and most authentic collection of pirate artifacts under one roof.” Among their spoils: the 1699 journal from Captain Kidd’s last voyage. Pirates used nicknames so that government officials couldn’t persecute their relatives on land. It is said that when Blackbeard was captured and beheaded by Lt. Robert Maynard, his headless corpse swam around the ship three times before sinking to the watery depths below. During the golden age of piracy, many a port town was host to debauchery and dubious delights, but one city in particular was known as “the richest and wickedest city in the world.” Port Royal, Jamaica boasted extensive taverns, brothels, and various illegal and illicit activities. Port Royal is now a premier tourist destination. You can read more about Talk Like a Pirate Day by clicking the link below! This entry was tagged Beyond Bizarre, pirates, Talk Like a Pirate Day. Bookmark the permalink.